We all know the places we can go to learn. Formal conferences and workshops. Less formal critique groups and beta readers. Reading books about writing, and reading other books—so many other books—by writers whose craft we simply admire. And of course, learning by doing, writing as much as we can every day, week, month, year. Put that way, it seems simple. Read enough, go to enough conferences, show our work to enough outside readers, get enough advice, and most of all, simply write enough, and slowly and surely, our stories will get better, improving incrementally as we put in our time. At least, it doesn’t work that way for me. For me, writing has never been about slow, steady, incremental learning, or not only about that. It’s also been about striving and stumbling and getting frustrated and wondering if I ought to give up (even while knowing I’d never really give up)—and then, often just when I’m despairing about ever successfully doing that new thing I’m trying to do, leaping forward without warning. I was glad someone thought so. But then one day, as I was rewriting a story I’d been working on for months yet again, I looked at a random passage and thought “Oh! They just want me to add more emotion and more description! I can do that!" Suddenly, without warning, I got it. And what I got was this: emotion and description are actually the same thing. I’ve had many other similar leaps forward since then—many times when I seemed to reach a plateau with my writing, only to have some aspect or other of my craft take an abrupt leap to the next level when I least expected it. It’s tempting to wonder whether all the time we spend methodically working to strengthen our craft means anything at all, if improvement is going to happen in leaps and lurches anyway. Yet I actually think all that time is crucial, and that the leaps forward wouldn’t happen without it. I think my subconscious mind is always working on the puzzle of how to be a better writer. Everything I learn, every critique I ponder, every book I read, every skill I practice, every flawed draft I write—they’re all pieces of that puzzle. What really happens without warning is not the learning itself, but the moments when the pieces click together, bringing new insights. Without the background learning, the foreground leaps can’t happen. Even so, when those leaps happen they feel like magic to me. Maybe they are. Magic, as any fantasy writer knows, is a powerful metaphor. But it’s magic we can prepare for. One day, week, month, and year at a time. Janni Lee Simner is the author of the post-apocalyptic BONES OF FAERIE trilogy; the Icelandic-saga based THIEF EYES; the kids’ adventure story TIERNAY WEST, PROFESSIONAL ADVENTURER; and of three more novels and more than 30 short stories. 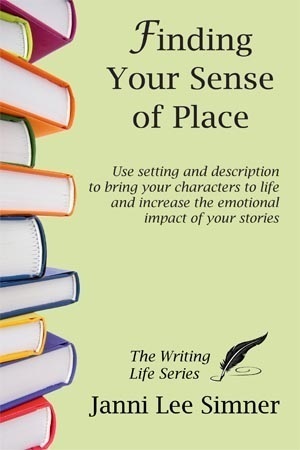 FINDING YOUR SENSE OF PLACE is her first book on the craft of writing.